U.S. schools’ demand for mobile computing devices in 2019 is expected to be relatively flat, increasing by only about 2 percentage points, after that same level of growth last year, according to Futuresource Consulting, a British research and consulting organization. Chromebooks represented nearly 60 percent of computers purchased last year for K-12 schools in the U.S., according to the company’s latest report on units shipped of Chromebooks, laptops, and tablets. Devices with Windows operating systems commanded second place, with 21.9 percent of the U.S. market, up from 21.7 percent the year before. The emergence of convertible devices—which can be used as a laptop or a tablet when detached from their base—has affected demand for tablets, the company found. In the U.S. last year, Apple shipped 17.7 percent of all mobile devices, of which 13.6 percent were iPads and 4.1 percent were Macs. That’s down from a total of 19.5 percent in 2017. In a 2017 special report, EdWeek Market Brief covered the battle for K-12 educators and students as Microsoft, Google and Apple—along with Amazon—go head-to-head in vying for big chunks of school business. As the U.S. market matures—with new computers often replacing ones that have come to the end of their lifecycles in schools—the major technology companies are looking for ways to solidify their positions with their K-12 customers, according to Ben Davis, senior market analyst at Futuresource Consulting. That means operating system providers will compete beyond price point and device functionality to add what he calls “incremental value” to their offering with a growing emphasis on how they can integrate with existing instructional and IT management solutions, Davis said. An increased emphasis on integrating data and providing data analytics, such as Apple’s use of the Schoolwork platform to personalize student learning through data, and Microsoft’s recent acquisition of DataSense. The moves are intended to retain existing customers and attract new ones. For example, “using a cloud platform makes it more difficult [for a district] to change a provider,” Davis said. Globally, Futuresource predicts that total shipments of these devices will grow 9 percent this year. 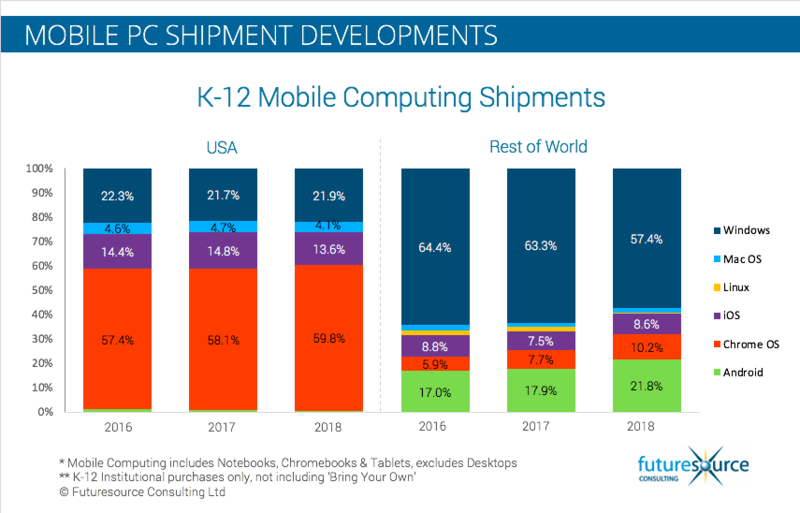 Last year, the worldwide market for mobile computing devices in K-12 expanded by 1.1 percent, reaching a total of 29 million units for the first time, the company’s analysis found. Major projects in Brazil, Egypt, India, and Africa are expected to drive that expansion, with an anticipated annual shipment of close to 32 million units around the world. Windows-based devices dominated, although computers with this operating system lost almost 7 percent of unit volume globally from 2017, with Android-based tablets gaining the most ground in schools, primarily because of emerging markets. Google’s Chrome operating system has continued to gain traction worldwide, increasing its share to 35 percent, Futuresource found. Western Europe has shown strong growth this year, with Chromebooks gaining ground in K-12 markets in the Nordic countries (Denmark, Norway, Sweden, Finland, and Iceland), the Netherlands and Spain, among others.